Confidence. Can it be Taught? As a mother to a teen daughter, I certainly hope confidence can be taught if not sent via osmosis but to be fair, she is a tween and thus hormonal. As a baby, toddler, and little girl, she was fearless. She tried different foods, new games, learned readily and commanded her environment. And she was headstrong…very headstrong. I assumed that this would translate into a confident young tween (and I have another six months to witness this transformation). She believes she knows better than I, but this is the time when my opinion doesn’t count as much as her friends no matter how I try to coach her to believe that no one’s opinion matters more than her own, and to yes, determine your own mind about all important things now so that she may go through her teens unbiased by her peers. As I recall my teen years, and I remember that I was painfully shy, and that didn’t read as confidence, two very different things. When I graduated grade school, I attended a very small, private high school…not my first choice, but rather my parents’. I went with the promise that if after two years I hated it, I could change schools (I was rather headstrong myself). My daughter exhibits this same behavior, so I don’t fret. If I grew out of it, and I believe I was shier than she, so I think she’ll be fine. I stayed at the small private high school the entire four years. I didn’t hate it, and perhaps, that was just my path. I don’t know where my 5’4’’ frame would be co-captain of the volleyball team, and I really did learn a lot about myself there. While it wasn’t an exact replica of how the world works, how it really is, during that time I gained a quiet sense of confidence. I witnessed how friendships were made and broken. Most importantly, I think I learned to accept myself just as I am, which is key to anyone transitioning to adulthood. The one thing that helped me was sports, which is why I made it a priority in my daughter’s life. She’s a sophomore now, and I’m keeping an eye on her. I do make sure I talk to her about self esteem and confidence, as I don’t want it to let it off my radar, or hers. There is a train of thought that says that children are our mirrors, especially girls and moms. If this is the case, it behooves us to show up at our best we can muster when in their presence. It can’t hurt, right? So ladies, shoulders back, head up, eyes front and center. 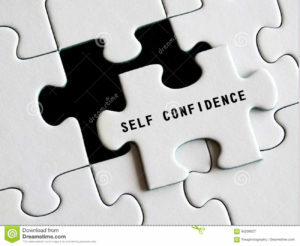 So while the jury is still out about teaching confidence, making your teen aware of it is super important. It’s got to be a part of the weekly/bi-weekly/monthly discussion because it is that critical.